Roasting the vegetables for this soup deepens and intensifies the flavors. 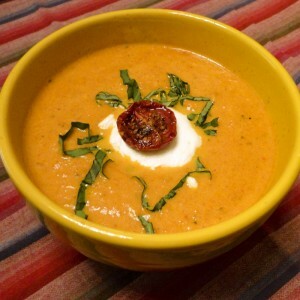 Tomatoes add complexity and coconut milk mellows and smoothes. The result is a richly satisfying soup. Roast the garlic by slicing off about 1" of the pointed tip. Drizzle with olive oil and place the cut tip back on top of the garlic clove. Wrap the garlic in tin foil and roast in the oven for 40 minutes until soft. Let cool and then squeeze the roasted cloves into the soup pot. If you have not used this method to roast garlic before, it will become your new best friend. Roasting transforms garlic into creamy goodness. Roasted garlic is a great addition to boost umami in soups, but can also be spread on a piece of toast, mashed into some potatoes, added to dips or eaten with chicken, steak or vegetables. For the smoothest results puree soup in a blender, but a food processor or stick blender will also work. Stick blenders are inexpensive, easy-to-use and can be used in the same pot the soup was cooked in. I always love methods that reduce the number of dishes you have to wash, as does my husband who is the über dishwasher in our house. 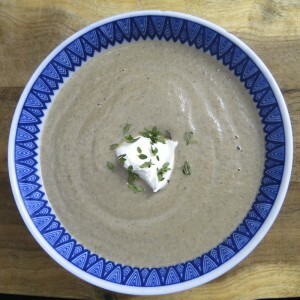 See my post on Creamless pureed vegetable soups for more on how to make pureed vegetable soups. Note: If using a blender, make sure you seal the blender top well, fill the blender no more than two thirds full and press down on the blender top when you puree the soup. If you are not careful hot soup will expand and blow the top off the blender. At best it makes a big mess, but can also cause burns if you are not careful. Coconut milk dramatically changes the flavor of this soup. My favorite coconut milk is Aroy-D. It comes in BPA-free cardboard boxes and is just pure coconut milk with no additives. Aroy-D was the number one choice of packaged coconut milk for all the cooks I worked with in Thailand. It comes in 8.5-ounce containers as well as 33.8-ounce containers. Make a little extra and put the leftovers in the freezer for a future meal. This soup is a nice choice for Thanksgiving. I like to serve guests a mugful for an appetizer when everyone is still milling around and before they sit down to the table. A mug of soup is a tasty way to build in some extra vegetables for the start of the meal and it can be made a couple days in advance. 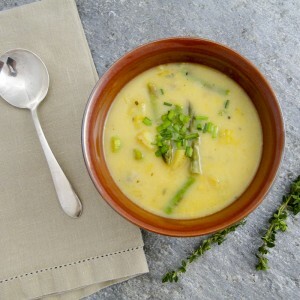 This soup is perfect for guests with dietary restrictions. It is gluten-free, and can be made dairy-free by skipping the yogurt garnish. It can be made vegetarian or vegan by using vegetable instead of chicken stock. 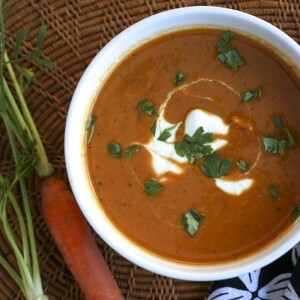 Roasting the vegetables for this soup intensifies and deepens the flavors, tomatoes add complexity and coconut milk smooths it all together into a delicious and satisfying soup. Heat oven to 400 degrees. Scatter carrots, onions and tomato halves in the bottom of two roasting pans, taking care not to crowd. Toss with 2 1/2 T olive oil and season with salt and pepper. Slice about one inch off the top of the garlic clove, leaving the peels on. Drizzle a 1/2 T olive oil over the slice and replace top. Wrap in tin foil and add to one of the roasting pans. Puree the soup using a blender, a food processor or a stick blender. Return the pureed soup to the pot and stir in the coconut milk. Taste and season with salt and pepper.